Over the past few months I have been doing a great deal of research on alternative and sustainable energy, and the possibility of an off grid sustainable art practice. My work requires a flame and that means I require a combustible gas and I have come to see bio methane as a potential source. Using bio methane is not a particularly new idea, both the EnergyXchange in North Carolina and Salem Community College in New Jersey run their facilities on landfill gas. What is new (at least for me anyway) is the idea of digesting one's own waste to fuel one's art. To test the feasibility of this I am making a series of small scale biodigesters. The first series of tests will be to determine the potential energy of a few pounds of household waste comprised of different ingredients but all representative of my typical daily waste. I will be batch digesting these samples and measuring the gas output and potential heat energy in BTUs. Because this is a batch digester and not a continuous feed system it will need to be agitated to optimize methane production. 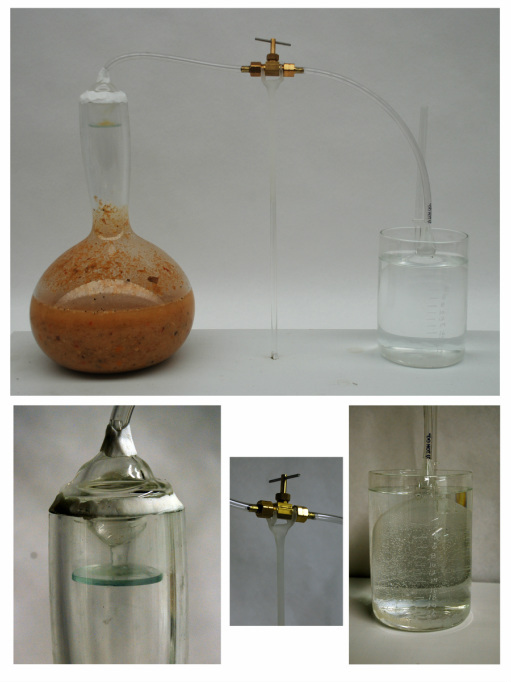 The plan is to measure the gas produced, the temp of of that gas and the temp of the biomass throughout the process. The PSI, volume, and temp of gas will give me the approx BTUs. I will include updates of the bio methane digester test as I continue to fabricate it. As usual it took me much longer than I expected but at long last on 5/22 at 10:30pm I managed to get the batch digester filled and put together. Hopefully there will be some gas soon. The process for complete digestion of solids can take anywhere from 10 to 90 days. The first step creates carbon dioxide and acids then the sugars begin to ferment and the methane producing bacteria starts working. It is day 3 and there is still no visible gas collection however there is bacterial activity producing heat and keeping the biomass about 1 degree f above room temp. After tonight I may move the apparatus to a warmer spot in the hopes it will aid the digestion process. So...there was a problem with the seals on the digester and I have gas leakage. Also the gas collector was too heavy and the gas pressure was not great enough to raise the cylinder (due to the leakage but also due to the fact that methane is difficult to pressurize.) . It is making gas though, as is evidenced by the partially inflated balloon hanging from the tube. I am reconsidering the design and simplifying some of the elements. Having to reconsider the design so soon has pushed me to make progress sooner and I'm even more excited post failure. This is the newest form for the digester. 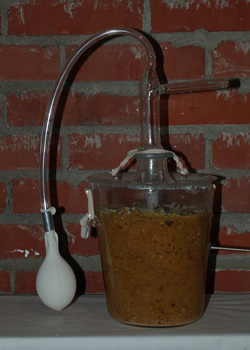 Instead of a complicated stirring mechanism the bottle is manually swished to agitate the biomass. The cap that is siliconed on has a splash guard so the gas collection holes don't get clogged. The collection cylinder is lighter and has a bead of silicone around the bottom to act as both a bumper and to increase buoyancy to make it as close to neutral buoyancy as possible so as not to inhibit the gas from accumulating. This digester is more a proof of concept variation than anything else. I had another leakage problem this time of the biomass variety. It also cracked at some point during my photography session. The next variation will include a way to test PH and administer lime as a buffer.